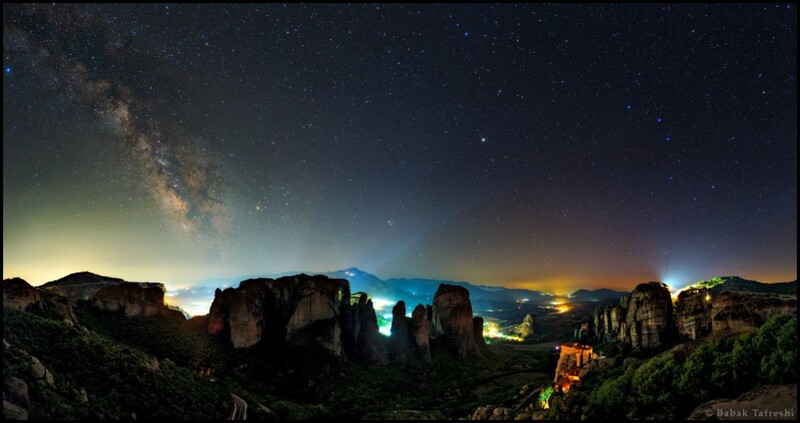 The Metéora (Greek: Μετέωρα, pronounced [mɛˈtɛoɾɐ], lit. “middle of the sky”, “suspended in the air” or “in the heavens above” — etymologically related to meteorology) is one of the largest and most important complexes of Greek Orthodoxmonasteries in Greece, second only to Mount Athos. 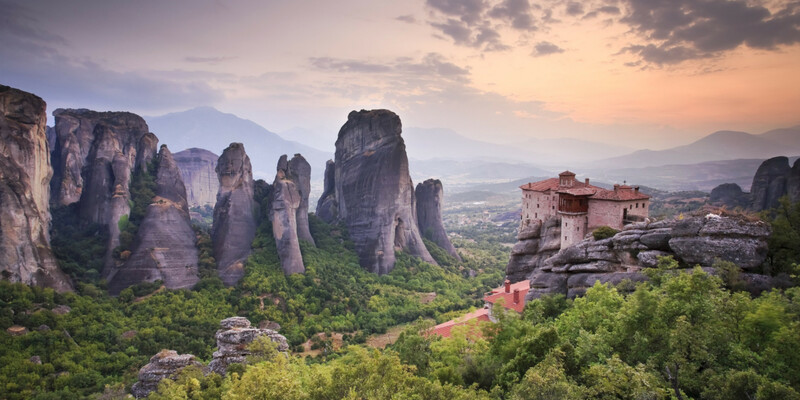 The six monasteries are built on natural sandstone rock pillars, at the northwestern edge of the Plain of Thessaly near the Pineios river and Pindus Mountains, in central Greece. 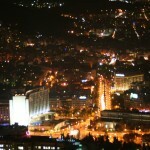 The nearest town is Kalambaka. The Metéora is included on the UNESCO World Heritage List under criteria. The Theopetra caves 5 kilometres (3.1 mi) south of Meteora had inhabitants fifty millennia ago.The oldest known example of a man-made structure was found within a prehistoric cave in central Greece, according to the Greek culture ministry. The structure is a stone wall that blocked two-thirds of the entrance to the Theopetra cave near Kalambaka on the north edge of the Thessalian plain. 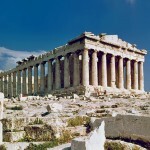 It was constructed 23,000 years ago, probably as a barrier to cold winds. “An optical dating test, known as Optically Stimulated Luminescence, was applied on quartz grains nested within the stones. We dated four different samples from the sediment and soil materials, and all provided identical dates,” Nikolaos Zacharias, director of the laboratory of archaeometry at the University of Peloponnese, told Discovery News. According to a statement by the ministry of culture, “the dating matches the coldest period of the most recent ice age, indicating that the cavern’s inhabitants built the stone wall to protect themselves from the cold.” Excavated since 1987, the Theopetra cave is well known to palaeontologists as it was used and inhabited continuously from the Palaeolithic period onwards (50,000 to 5,000 years ago). In the 9th century, an ascetic group of hermit monks moved up to the ancient pinnacles. They were the first people to inhabit Metéora. They lived in hollows and fissures in the rock towers, some of which reach 1800 ft (550m) above the plain. This great height, combined with the sheerness of the cliff walls, kept away all but the most determined visitors. Initially the hermits led a life of solitude, meeting only on Sundays and special days to worshipand pray in a chapel built at the foot of a rock known as Dhoupiani. As early as the 11th century AD hermit monks were believed to be living among the caves and cutouts in the rocks. The exact date of the establishment of the monasteries is unknown. By the late 11th and early 12th centuries, a rudimentarymonastic state had formed called the Skete of Stagoi and was centered around the still-standing church of Theotokos (mother of God). By the end of the 12th century, an ascetic community had flocked to Metéora. In 1344, Athanasios Koinovitis from Mount Athos brought a group of followers to Metéora. From 1356 to 1372, he founded the greatMeteoron monastery on Broad Rock, which were perfect for the monks; they were safe from political upheaval and had complete control of the entry to the monastery. The only means of reaching it was by climbing a long ladder, which was drawn up whenever the monks felt threatened. At the end of the 14th century, the Byzantine Empire’s 800-year reign over northern Greece was being increasingly threatened byTurkish raiders who wanted control over the fertile plain of Thessaly. The hermit monks, seeking a retreat from the expandingTurkish occupation, found the inaccessible rock pillars of Meteora to be an ideal refuge. More than 20 monasteries were built, beginning in the 14th century. Six remain today. In 1517, Nectarios and Theophanes built the monastery of Varlaám, which was reputed to house the finger of St John and the shoulder blade of St Andrew. In 1921, Queen Marie of Romania visited Meteora, becoming the first woman ever allowed to enter the Great Meteoron monastery. In the 1920s there was an improvement in the arrangements. Steps were cut into the rock, making the complex accessible via a bridge from the nearby plateau. During World War II the site was bombed. Many art treasures were stolen. Until the 17th century, the primary means of conveying goods and people from these eyries was by means of baskets and ropes. Six of the monasteries remain today. Of these six, four were inhabited by men, and two by women. Each monastery has fewer than 10 inhabitants. The monasteries are now tourist attractions. Average elevation is 313 metres (1,027 ft). Studies suggest that the pinnacles were formed about 60 million years ago during the Paleogene Period. 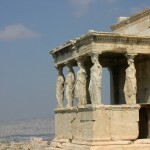 Weathering and earthquakes then shaped them into their present shape. Beside the Pindos Mountains, at the western region of the Thessaly, in the middle of northern Greece, these sandstone rocks rise from the ground. The rocks are composed of a mixture of sandstone and conglomerate. They were formed about 60 million years ago. A series of earth movements pushed the seabed upwards, creating a high plateau and causing many fault lines to appear in the thick layer of sandstone. Continuous weathering by water, wind and extremes of temperature turned them into huge rock pillars, marked by horizontal lines which geologists maintain were made by the waters of a prehistoric sea. Greek historian Herodotus wrote in the 5th century BC that local people believed the plain of Thessaly had once been a sea. If this was accurate, there was most probably an inundation at the end of the last Ice Age, around 8000 BC. However, he failed to mention the rocks of Metéora and they are not recorded in the writings of other ancient Greek authors. This has led to the belief that the pinnacles did not exist 2000 years ago; a theory dismissed by modern geologists. The cave of Theopetra is located 4 kilometres (2.5 mi) from Kalambaka. Its uniqueness from an archeological perspective is that in it contains, within a single site, the records of two greatly significant cultural transitions: The replacement ofNeanderthals by modern humans, and the later transition from hunter-gathering to farming after the end of the last Ice Age. The cave consists of an immense 500 square metres (5,400 sq ft) rectangular chamber at the foot of a limestone hill, which rises to the northeast above the village of Theopetra, with an entrance 17 metres (56 ft) wide by 3 metres (9.8 ft) high. It lies at the foot of the Chasia mountain range, which forms the natural boundary between Thessaly and Macedonia prefectures, while the Lithaios River, a tributary of the Pineios River, flows in front of the cave. The small Lithaios River flowing literally on the doorsteps of the cave meant that cave dwellers had always easy access to fresh, clean water without the need to cover daily long distances to find it. Excavations and research and have discovered petrified diatoms, which have contributed to understanding the Palaeo-climate and climate changes.Radiocarbon dating evidences human presence dating back 50,000 years. The cave is open to the public.